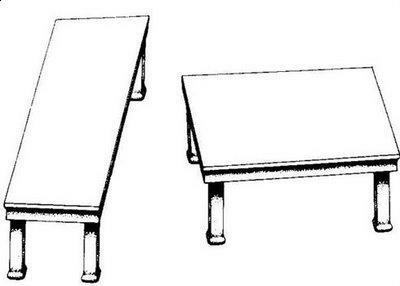 These two tables in this image by Roger Shepard appear to be different sizes, the one on the left is oriented vertically and seems to be longer and thinner. Remarkably, both tables are actually exactly the same size. these are awesome and the fat lady in the backround is really cool cause i love seeing her knees buldge! you'll crap your self when you see those bad boys (the knees)! this is actually not true, i printed off this image, and cut out the tables placing them on top of each other. the one on the left is actually wider and shorter than the one on the right. this is no illusion. Sorry Matt, you lose! Maybe your printer isn't accurate. Try drawing one for yourself. Cut out a parallelogram, then trace around it. Add legs and you'll get the same effect. I think they meant the same size long ways. this is a creepy illusion! How can they actual be the same? try measuring with a ruler u dipstick! i come here very often everyday so u can talk to me!!! All depends of the position for the object., and also the perspective. If you have a round jar ( cream for a face for example ), and if you try to see the tap on high position from your eyes, is going to look small like a shape of an eye, but if you move the top of the cream down to you chest?., is going to look more big. These tables are a good example how an object to can change from a different perspective of point or angles.